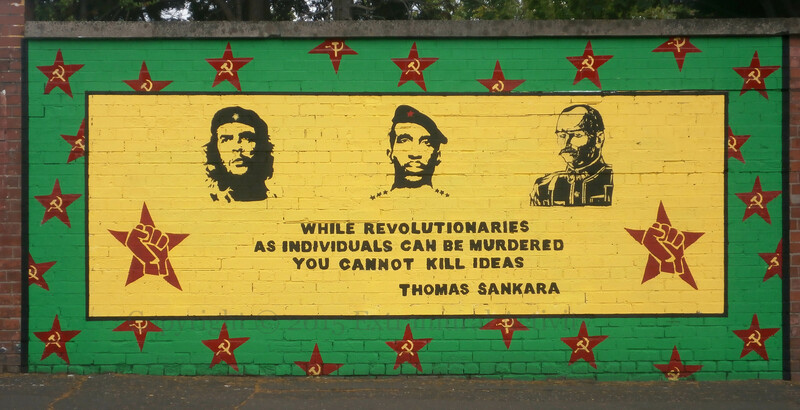 A week before he was assassinated and his government overthrown, Burkina Faso president Thomas Sankara asserted: “While revolutionaries as individuals can be murdered, you cannot kill ideas.” Sankara gained power of Burkina Faso (then Upper Volta) in a 1983 coup and launched an ambitious programme of literacy, feminism, public health, and agricultural self-sufficiency, in addition to launching a drive against corruption and nationalizing natural resources. He attempted this all without the assistance of foreign aid or the IMF or World Bank. However, he wielded power outside the jurisdiction of the courts and controlled the press. He and twelve colleagues were killed in October 1987. Hello John – It’s on Beechmount Ave, around the bend but before the portraits of victims. Thanks for the info. Keep well.